Someone recently asked me, “Chris, what inspires you?” Without missing a beat, I replied, “There are times when the AMP musicians understand a new concept, when a technique they have been struggling with suddenly ‘clicks’ – and they get it, and they know they get it. Seeing their satisfaction and the joy from their accomplishment – that inspires me.” It was surprising how quickly this answer arose and that I even had a specific moment that came to mind. That memory is of a rehearsal at Gilbert House back in October. We were rehearsing Telemann Sinfonia in A minor, a baroque piece, and the students were struggling with baroque stylizing. We did every trick in the book: we sang passages, we played rhythms with open strings, we played figures with scales, we sang melodies with made-up words – and nothing seemed to stick. And then, one day, it just “clicked”. We read through the Telemann and it was fantastic! I turned to the students and they were beaming ear to ear – they knew they got it and understood that they were finally able to execute the baroque technique. We continued rehearsal, fine tuning details, the room filled with energy and excitement. As the students packed up, many of them were singing the lines from the Telemann with our made up words. Why does this inspire me? Because moments like this is what the Atlanta Music Project is all about. Seeing these young musicians execute complicated musical concepts and more importantly, having them understand the significance of their own success, is incredibly powerful. If the AMP students can have the discipline, work ethic, and support from their families and community to perform baroque style (which is not easy!) then they can realize even greater achievements. Graduating high school, graduating college: all of this can be attained, through this proven belief in self. I approach my music making with this sense of inspiration as much as possible. It is humbling to see how music can inspire and I know it will continue to enrich and empower the AMP students for many more years to come. 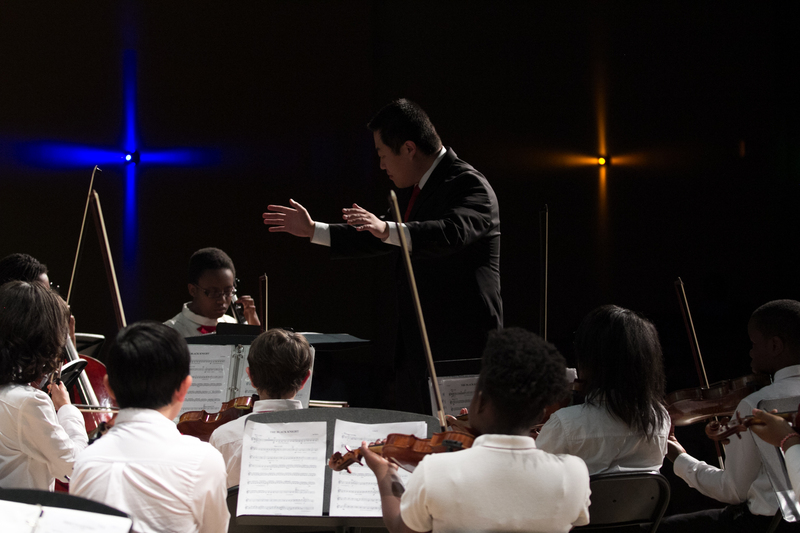 Christopher Thibdeau conducts the Atlanta Music Project Orchestra during a concert.